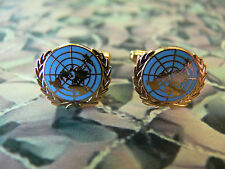 NEW United Nations Other Ranks Cap / Beret Badge. All Ranks. United Nations. Manufactured to the highest standard by MoD approved. Pin Broach - Fixing on Rear. LAPEL PIN BADGE. 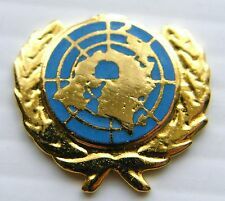 UNITED NATIONS BADGE. ONE BADGE SUPPLIED IN VELVETINE GIFT POUCH. THE UNITED NATIONS WHITE COLOUR UN. BUTTERFLY CLASP TO REAR WITH. SINGLE PIN FASTENING. GIFT NOVELTY. 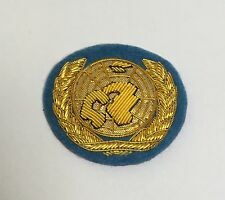 United Nations (UN) Military Peace Keeping Force Beret Badge. Estimate C1990s. Pin fitting. In good used condition. Diam: 52mm. 10" length of full size ribbon. 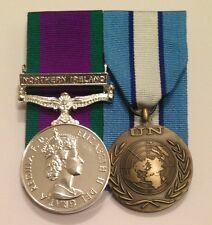 TKS - Issue OR's United Nations Cap Badge - UN Beret Badge. Condition is Used, please note slight damage (see pictures) Dispatched with Royal Mail 2nd Class Large Letter. The buckramis wrapped in navy blue fabric and finished off with black felt on the back; itis fitted with a brooch pin so it can be pinned on to your jacket and secured. WITH CLASP : MINUGUA. UK = £1.50 OVERSEAS = £4.00. CourtMounted and ready to wear. The buckram is wrapped in navy blue fabric and finished off with black felt on the back; it is fitted with a brooch pin so it can be pinned on to your jacket and secured. 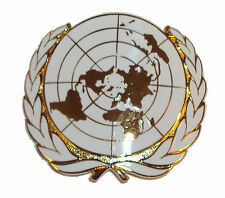 THE UNITED NATIONS BADGE PENDANT. 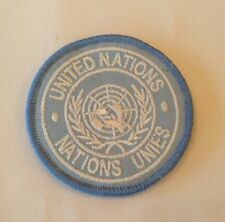 THE UNITED NATIONS UN WHITE BADGE. CHAIN LENGTH APPROX 20" WITH BOLT RING FASTENER. CRESTED BADGE ON. HEAVY SOLID QUALITY PENDANT IN VELVET LINED CARD BOX. OUT OF GOLD PLATED OR SILVER BRIGHT NIKEL PLATE. 1 X CLOTH SLEEVE PATCH. WITH CLASP UNCRO. FOR SERVICE IN CROATIA. IN MINT CONDITION. COMPLETE WITH RIBBON TO DENOTE SERVICE WITH UNPROFOR IN BOSNIA. UK = £1.50 OVERSEAS = £4.00. 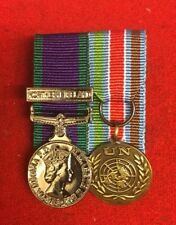 This is a United Nations Cyprus Full Size Medal with Ribbon. The medal size is approx 35mm in diameter. Made in the United Kingdom. This medal is unmounted. We can mount medals and stock most medals. If you have any questions please do not hesitate to contact us. The ribbon has three equal bars, one of white in the centre and two of UN blue either side. COMPLETE WITH RIBBON TO DENOTE SERVICE WITH THE UNSMIS MISSION IN SYRIA. ( UN SUPERVISION MISSION IN SYRIA ). UK = £1.50 OVERSEAS = £4.25. COMPLETE WITH RIBBON TO DENOTE SERVICE WITH CONGO 2. UK = £1.50 OVERSEAS = £4.00. COMPLETE WITH RIBBON TO DENOTE SERVICE IN THE CONGO 1963. UK = £1.50 OVERSEAS = £4.00. 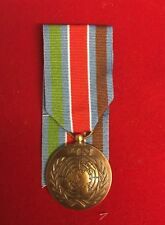 This is a United Nations Yugoslavia Full Size Medal with Ribbon. The medal size is approx 35mm in diameter. Made in the United Kingdom. 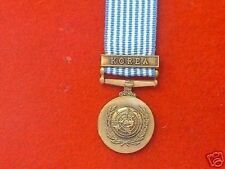 This medal is unmounted. We can mount medals and stock most medals. If you have any questions please do not hesitate to contact us. AND SMALL SIZE CLASP: UNMIH ( UN MISSION IN HAITI ). COMPLETE WITH RIBBON TO DENOTE SERVICE IN HAITI. 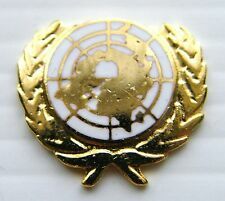 THE UN UNITED NATIONS WHITE BADGE. THE UNITED NATIONS BADGE CARD CASE. CRESTED BADGE ON. CREDIT CARD CASE. ONE CARD CASE SUPPLIED IN CARD/PAPER BOX. CARD CASE SIZES ARE. Make Supersized Seem Small. Made in the United Kingdom. Get Images that. British Army Lance Jack UN bassard. WITH CLASP OSGAP. (AFGHANISTAN AND PAKISTAN). COMPLETE WITH RIBBON TO DENOTE SERVICE IN SIERRA LEONE WITH THE UNOMSIL MISSION. UK = £1.50 OVERSEAS = £4.00. COMPLETE WITH RIBBON TO DENOTE SERVICE IN BURUNDI. UK = £1.50 OVERSEAS = £4.00.